I didn’t intend to continue this series but as my kind readers have pointed out, I have missed several major landmarks in that gentle and scholarly neighborhood of the past. These articles have become a two-way street as I am learning and reminiscing right along with you from the many comments, emails and photos I’ve received ! Thank you all ! My family rented apartments until the mid-Fifties when mom finally got her dream of building a new home. They selected a lot in a new suburb of Makati called San Lorenzo, a topic I will discuss in a later post. We moved to our last apartment on Pennsylvania Ave. called the Mayflower Apartments, anxiously waiting for our new home to complete. I was surprised to see it still there when we visited Manila in 2012. I was pleased to see how little it had changed; we lived on the first floor with windows overlooking the street. The parking lot in the back still had that old mango tree that was perfect to climb and naturally pick some green mangos to eat… with salt ! But darn those ants anyway ! At any rate, this was the neighborhood I wandered through at the age of about 10, riding the sidewalks on my new balloon-tired one speed bicycle – streamers flying from the handlebar grips – up on the sidewalks, down the streets, under trees that shaded you from the hot sun. Up on Oregon, down Colorado, left on Herran turning on San Marcelino…ah, the freedom of youth ! Before they made their move to Quezon City, Maryknoll College was located very close to our apartments. One of my readers is Angelina Gutierrez-Frey who went to Maryknoll in the mid-Fifties. 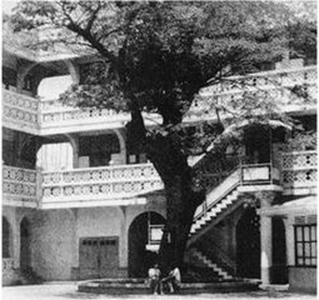 Angelina was kind enough to submit the following photos of the old buildings of Maryknoll. 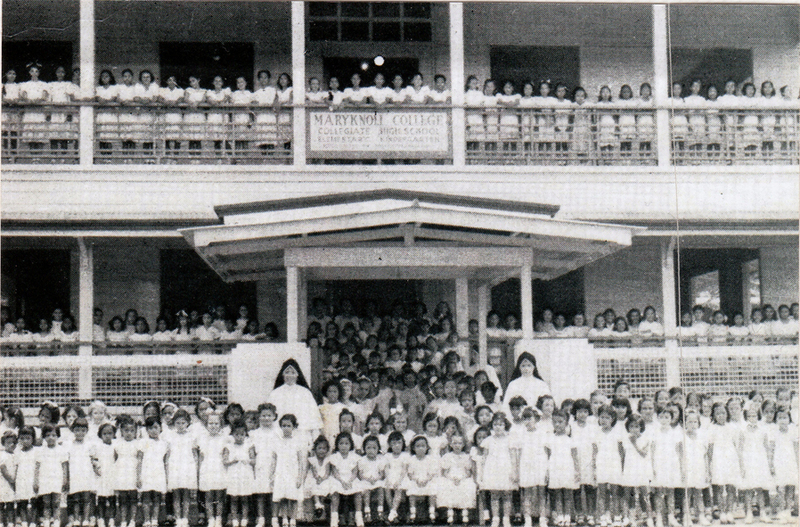 The story of Maryknoll College goes back to 1926 when the Archbishop of Manila, Rev. Michael O’Doherty, requested the Sisters of Maryknoll Congregation to start a teacher-training program for women in the Philippines. 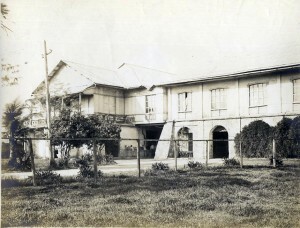 Under the auspices and support of the Archbishop, the Malabon Normal School was established in an old Augustinian convent. Due to financial difficulties, the Archdiocese could no longer continue to support the school in Malabon. 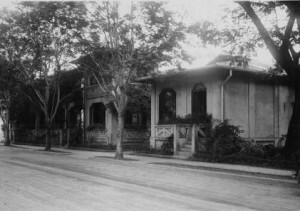 In 1936, The Sisters assumed full financial control and opened their own Maryknoll Normal College in Manila, first on Isaac Peral, and in 1938 moved to Mabini Street. The grade school and high school in Malabon became St. James Academy. After the war, the Sisters re-opened the school in a private house on Fernando Rein Street and eventually transferred to two Quonset huts to accommodate increasing number of students. Maryknoll at Pennsylvania Ave. and California. Maryknoll College (1949) – 610 Pennsylvania Ave. 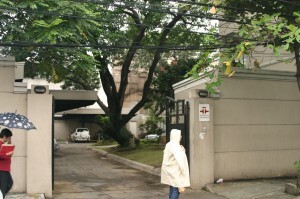 In quick succession, Maryknoll Sisters assumed two other works in Manila. One was St. Mary’s Hall, a hostel (or dormitory) for women, situated on 602 Pennsylvania Avenue, not far from Padre Faura Street where the University of the Philippines was then located. 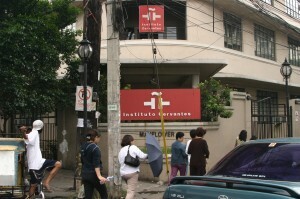 Maryknoll Sisters also assumed direction of St. Paul’s Hospital at the corner of Gral. Luna and Anda Streets, Intramuros, which had been begun by Sisters of St. Paul de Chartres. Over the years, almost three hundred Maryknoll Sisters have been assigned to the Philippines. During WW II, the Sisters were held at the Los Baños Internment Camp but the bond between the Filipino faithful and the Sisters remained strong as the Filipinos took risks to share scarce food with them during their confinement. 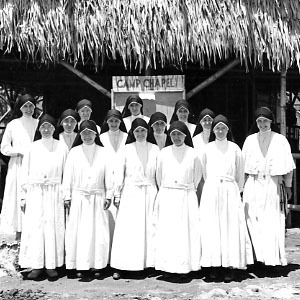 After liberation, the Sisters were invited to leave the country with the withdrawing U.S. troops but declined, wanting to remain with the Filipino people. 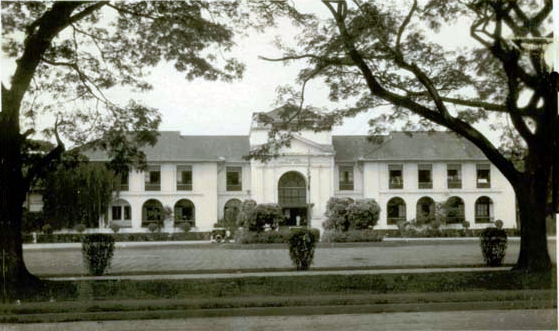 In 1953, Maryknoll College reopened on a bigger scale in Diliman. In 1977, the ownership and management of the school was turned over to lay administrators and the name Maryknoll was changed to Miriam College acknowledging the role of its past president. Sister Miriam Thomas was assigned to Maryknoll at Malabon in 1935. 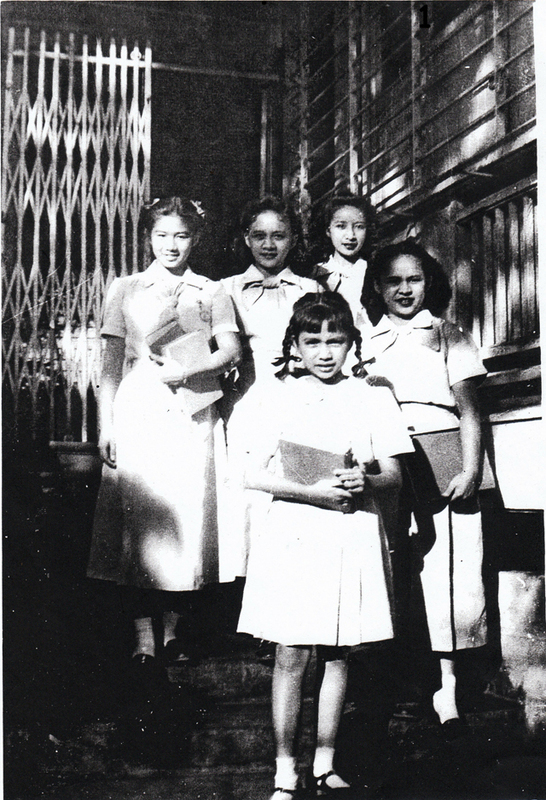 She was studying for her doctorate as World War II broke out and she and the other Sisters were interned in the prison camp at Los Baños. Sister Thomas brought along her books and painting materials, and despite the hardships and the weakness she experienced from the starvation diet in the camp, Sister was able to finish writing her doctoral dissertation. She even designed a holy card for others in the camp. Shortly after liberation, and still in poor health from life in the camp, she was able to defend her dissertation and received the highest grade “Meritissimus” from the University of Santo Tomas, Manila in 1945. The Philippine Government issued a memorandum in 1973 on educational institutions stating that ownership, control of administration, curriculum and enrollment were to be held by Filipinos. After a total of 18 years as President of Maryknoll College, Sister Miriam Thomas quietly, but happily, withdrew from the position. At that time it was agreed that the name of the College would not be changed immediately. When the change took place ten years later several reasons led to the selection of the name “Miriam College” and one of them was to express gratitude to the person who had devoted herself so much to the school. 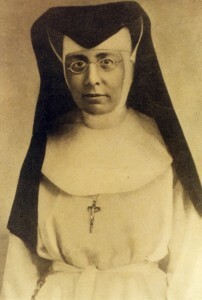 Mother Marie Louise De Meester from Belgium, landed in Ilocos Sur in 1910 and commenced a missionary program throughout the Philippines. She founded St. Theresa’s College Manila (STCM) in 1915 at the invitation of the Most Reverend Jeremiah Jame Harty, the first American Archbishop of Manila. The school was located at 920 San Marcelino Street. Typical of Catholic schools and girls schools in particular, discipline was stressed including academic instruction, religious teaching, character development, even music and the arts. Silence, orderliness, courtesy and honesty were corollary rules, violations of which were penalized, while proper behavior was rewarded with merit cards, estampitas and rosaries; many of the traits that, sadly, have somehow lost their significance in today’s generation. A photo of the studious, quiet and reverential students shown at left. A fine example of dedication, Sr. Asuncion Martinez came from a rich family in Leyte where her father was once governor. She was born Esther Martinez, joined the Missionary Sisters of the Immaculate Heart of Mary (ICM) as a postulant in 1934, and took her vows and adopted her new name in 1937. She became Sr. Ason to friends and colleagues. From 1937 to 1950 she taught high school and college subjects in congregation-run schools such as the Holy Family Convent, St. Theresa’s College Manila and the Infant Jesus Academy. 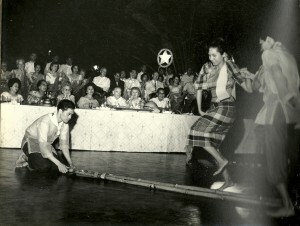 She was the Belgian-dominated ICM’s first Filipina superior in 1950, and first Filipina provincial councilor from 1959 to 1969. She also served as superior of St. Theresa’s College in Quezon City. 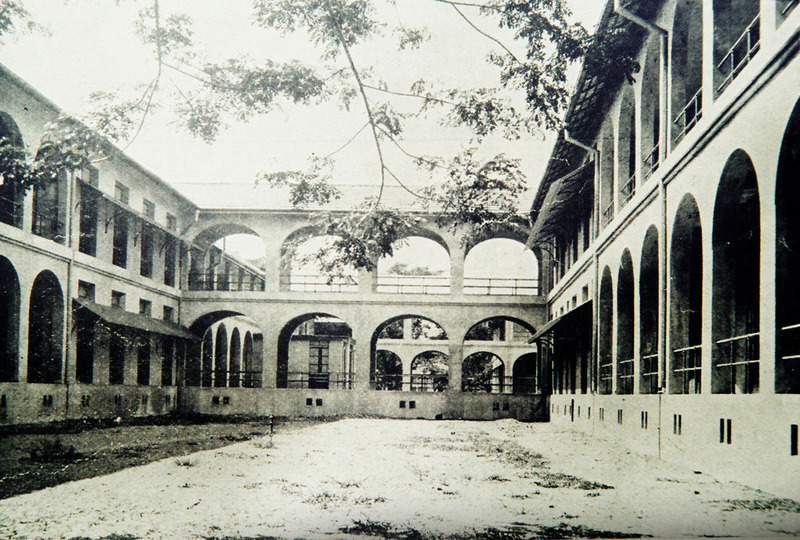 St. Theresa’s College Manila was re-built, re-opened and continued to be run by the Belgian Sisters until 1980. 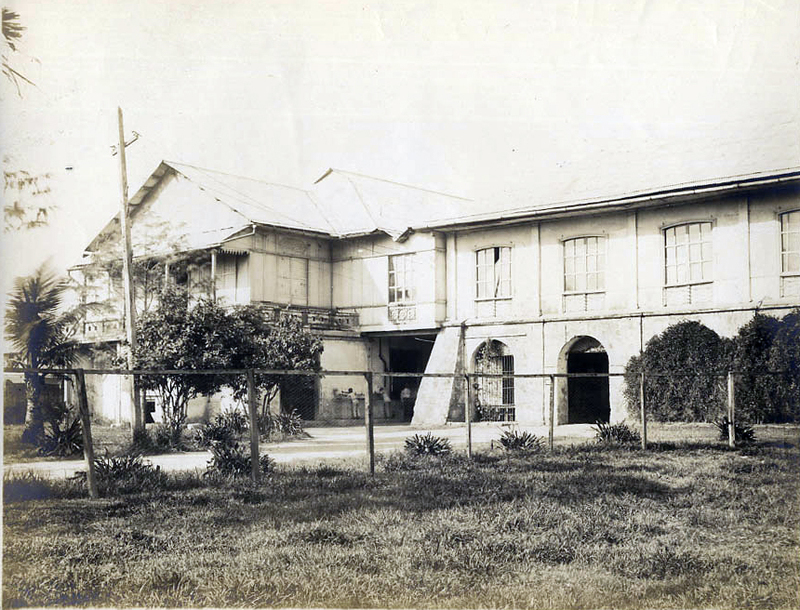 In order to accommodate an ever-growing population of students, steps were taken after WWII to look for a property which would be larger than the San Marcelino Compound. In January 1946, a contract was signed for the purchase of a property consisting of five blocks, in Sta. Mesa Heights, Quezon City. January 7, 1947, marked the establishment of STCQC. 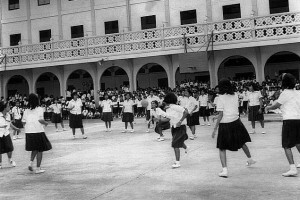 The school was officially opened in June 1947. 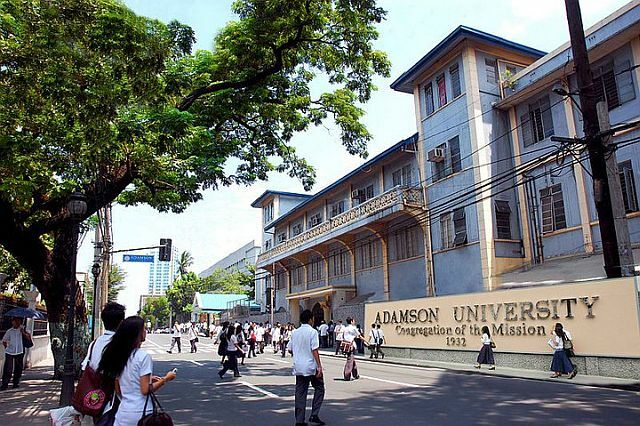 The Saint Therese Building, former site of Saint Theresa’s College, was absorbed into Adamson University. Within its grounds are the Saint Therese Quadrangle, Botanical Garden, Adamson University Chapel and Speech Laboratory. It houses the Vice President for Student Affairs’ Office, College of Education and Liberal Arts, College of Sciences, College of Pharmacy and College of Business Administration. Dr. George Lucas Adamson, a Greek chemist from Athens, founded the school in 1932. George and his brother Alex, rented the Paterno Building next to the Santa Cruz Bridge near Plaza Goiti. 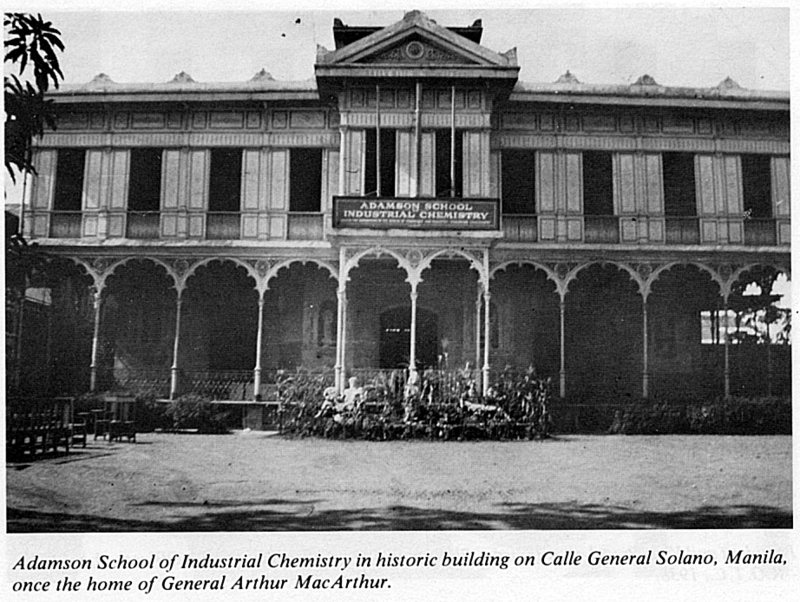 It was impressively named the Adamson School of Industrial Chemistry and Engineering (ASICE) catering to students who wished to learn the simple fundamentals of chemistry and the basic techniques for small industries like leather tanning, soap making, and salt production. 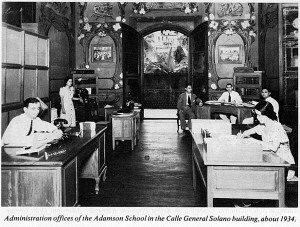 It was later called Adamson University (AdU) upon approval by the Secretary of Public Instruction for university status, on February 5, 1941. The new school, after appropriate advertising, attracted forty students on its opening day. Their goal was to qualify as a private college accredited by the government. By 1934, there were approximately 370 students, which demanded that larger quarters were needed. 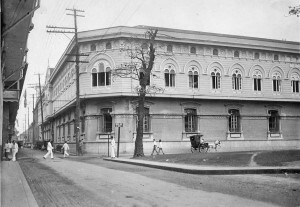 The move was made to a historic building on Calle General Solano on the Pasig River, which earlier served as a home of the Spanish Navy Admiral, then the U.S. Military Governor Arthur MacArthur. 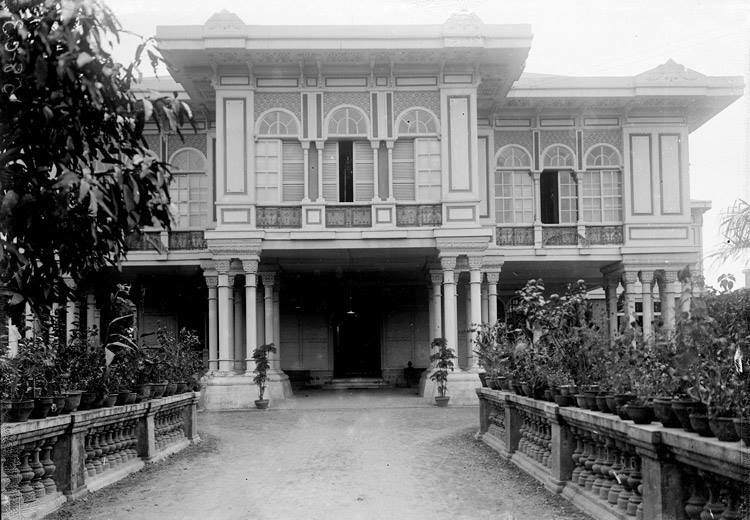 Later called the “Goldenberg Mansion”, it was bought by cosmetics manufacturer Michael Goldenberg and was eventually bought by the Philippine government during the Marcos regime in 1966 and is currently part of the Malacañang complex. The school was quite a family-run operation. George Lucas’s cousin Alexander Athos Adamson came to Adamson shortly after its opening to help the fledgling school. Alexander joined the administration on July 15, 1932, serving at one time or another as Vice President, Treasurer and Registrar. 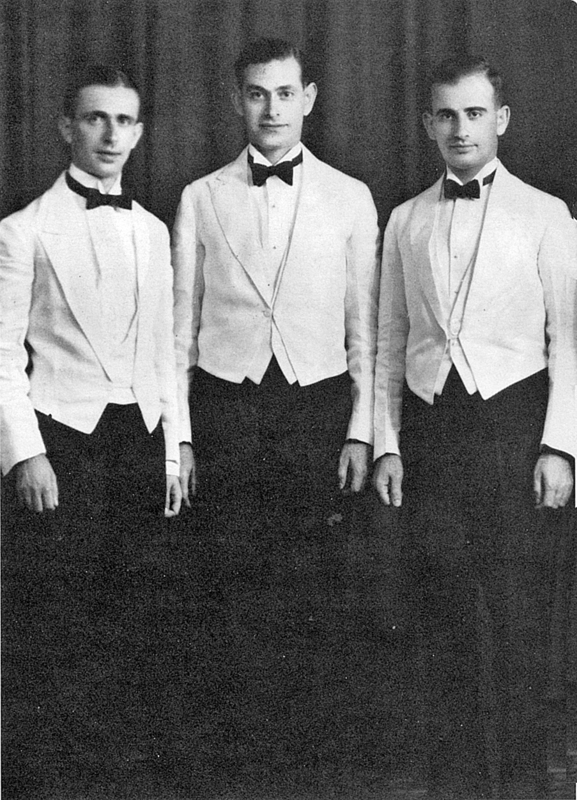 Alexander’s brother George Athos Adamson also came onboard in 1934, becoming the School Dean, Dean of the College of Engineering and professor. Evdoxia Savaides Adamson, wife of George Lucas, started working and teaching in the University in 1939, then served as Dean of the College of Education and of the College of Liberal Arts and Sciences. 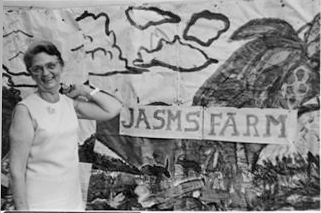 Sofia Adamson, George Athos’s wife, taught in the College of Education after arriving in 1939 and briefly served as Directress of the Junior Normal College. Except for George Athos and Sofia who left after the war, all the Adamsons remained working in the University until its turnover to the Vincentian Fathers and Brothers of the Congregation of the Mission in 1964. George Lucas Adamson served as President until 1967, for a total of 35 years, including a three-year holdover stint at the assumption of the Vincentians as administrators. 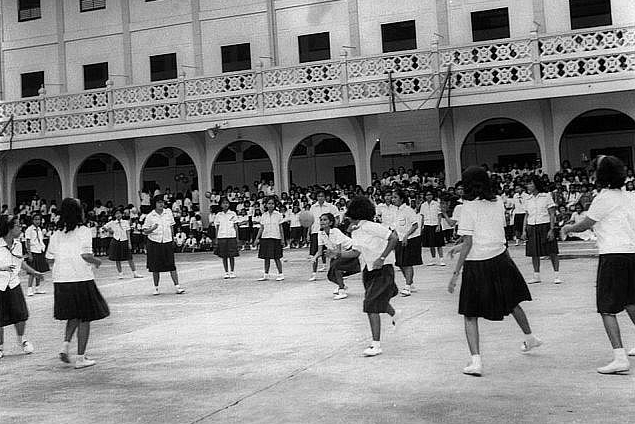 Before finally settling on its permanent home along San Marcelino Street in 1946 after the war, the school stayed in three different locations: Sta. Cruz (1932-1933), San Miguel (1933-1939) and Intramuros (1939-1941). At 900 San Marcelino, the University expanded with the acquisition of the Meralco building in 1968 and the St. Theresa’s College-Manila campus in 1977, both just across the street. The American colonial government’s program to improve and expand health services included the construction of hospitals. 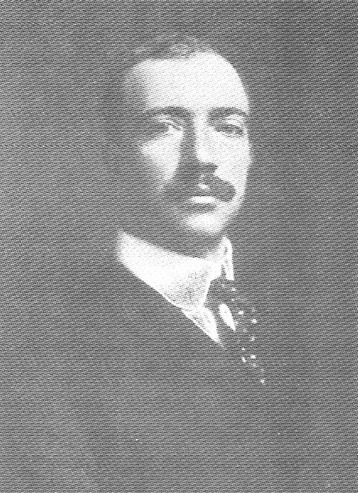 For the implementation of his plans for Manila and Baguio, Burnham recommended William E. Parsons, a product of Yale, Columbia, and the Paris Ecole des Beaux Arts. Parsons served as consulting architect of the Bureau of Public Works from 1905 to 1914. An outstanding example of Parsons’ approach to design is the Philippine General Hospital (PGH), a building neoclassic in its disciplined elegance and highly practical in its loose and airy arrangement of pavilions. A front pavilion housing the administration, leads to a central area where common facilities are located and from both sides of which pavilions branch out separated by courtyards and connected by arcaded galleries. Each pavilion houses a department: medical, surgical, orthopedic, and maternity. One pavilion is devoted to private rooms. The building is formal and symmetrical, the plan being somewhat like an organizational chart. The design is most appropriate for the tropics, since each wing is designed for maximum ventilation and protection from rain. In the PGH, Parsons introduced a style of modern architecture, functional in plan, and employing the traditional arch while minimizing surface ornament. 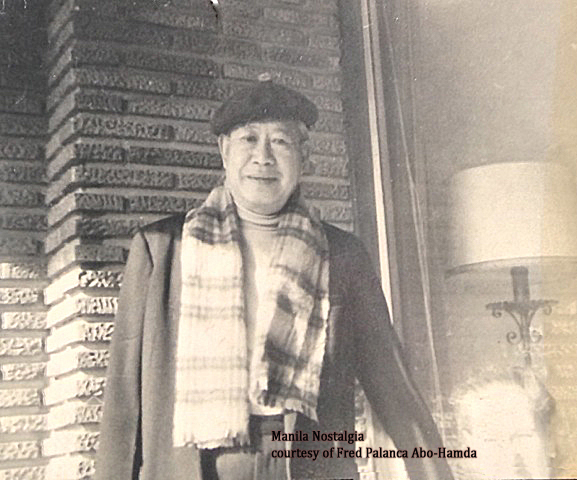 Tomas Mapua, who graduated from Cornell University in 1911 and worked as draftsman at the Bureau of Public Works from that year until 1915, designed the Nurses’ Home of the PGH, one of the finest examples of the neo-renaissance style in the country. The hospital was founded by Dean C. Worcester, (1866 – 1924) an American zoologist, public official, and authority on the Philippines, born at Thetford, Vermont, and educated at the University of Michigan (A.B., 1889). 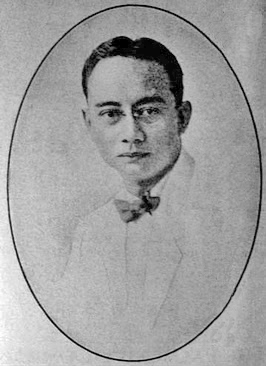 From 1899 to 1901 he was a member of the United States Philippine Commission and then until 1913, he served as secretary of the interior for the Philippine Insular Government. 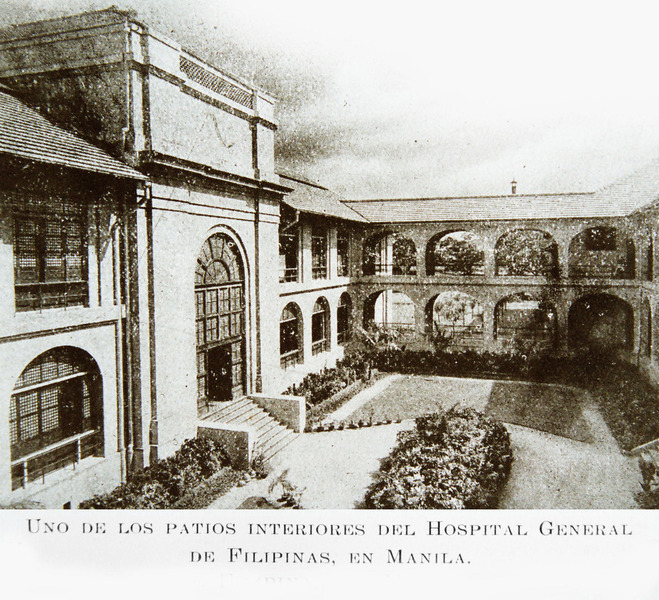 Worcester founded the Philippine General Hospital in 1910. Initially called Civil Hospital housed in a large private dwelling adjoined by 2 smaller buildings, PGH is now a state-owned hospital operated by the University of the Philippines and is the biggest hospital in the country with 1,500 bed capacity; 1000 beds allotted for indigent patients and 500 beds for private patients. PGH is generally known as the hospital for indigent patients. Update: 8/24/2013 – I received a correction from another reader stating Dr. Luis Torres, considered the “Founder of Modern Urology in the Philippines” was also founder of the first medical fraternity of the country, Phi Kappa Mu, not Upsilon. 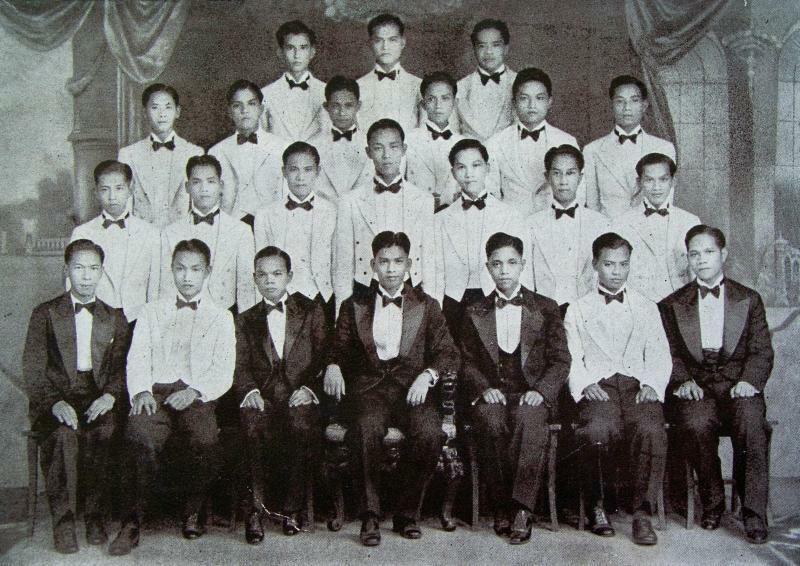 The name Phi Kappa Mu was conceived by Luis Torres Jr. who along with Jose Barcelona were among the first Filipino members of the Phi Kappa Phi Honor Society. The constitution and by-laws were created through the efforts of Leopoldo Vergel de Dios. The fraternity song was composed by Cesar Villafuerte and Herminio Velarde, Jr. in 1939. Another reader, Ben Oteyza recalls, “The Brown Derby, in front of PGH, was the place to be for students of UP Medicine and PGH nurses, and Jai Alai for those with extra pocket money.” Ben later married a PGH nurse and are proud parents of 6 grown children. His comment reminded me of those marvelous foot-long hotdogs served with a special extra tart mustard and hot, crispy bun at the Brown Derby; a young boy’s dream, and who can forget the vanilla soft ice cream sundaes you could get at the Dairy Queen on Taft Avenue….chocolate sauce and chopped nuts ! Oh boy ! 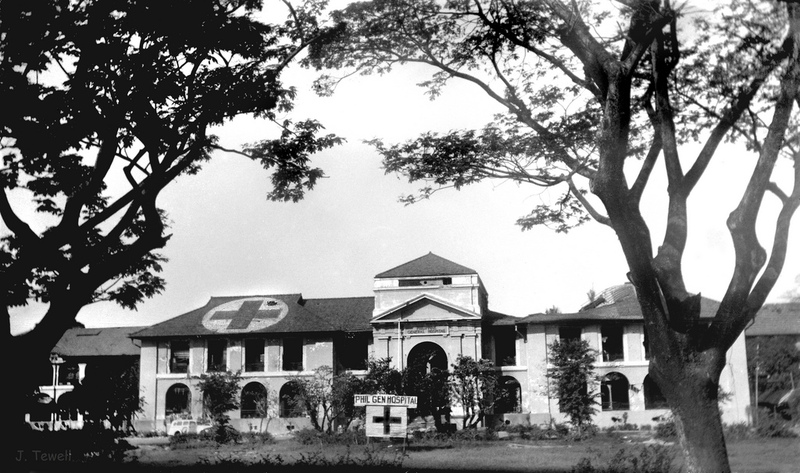 The Philippine General Hospital was a public hospital but regardless was fortified by the Japanese during the occupation in violation of the Geneva Convention. There were few Japanese in the hospital with gun placements on the grounds outside to defend their position as the Americans were taking back Manila. On the roof on both ends, were large white circles with large red crosses. From Feb. 14 to Feb. 17, 1945 the Americans shelled the area. Some of the shells hit the buildings inflicting some damage however inside, the many Filipino patients and several thousand Filipino refugees that were seeking what they thought would be safe shelter, were murdered by the Japanese. 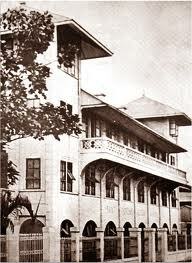 On June 9, 1919, what would eventually be PWU opened its first classes as the Philippine Women’s College in Manila. 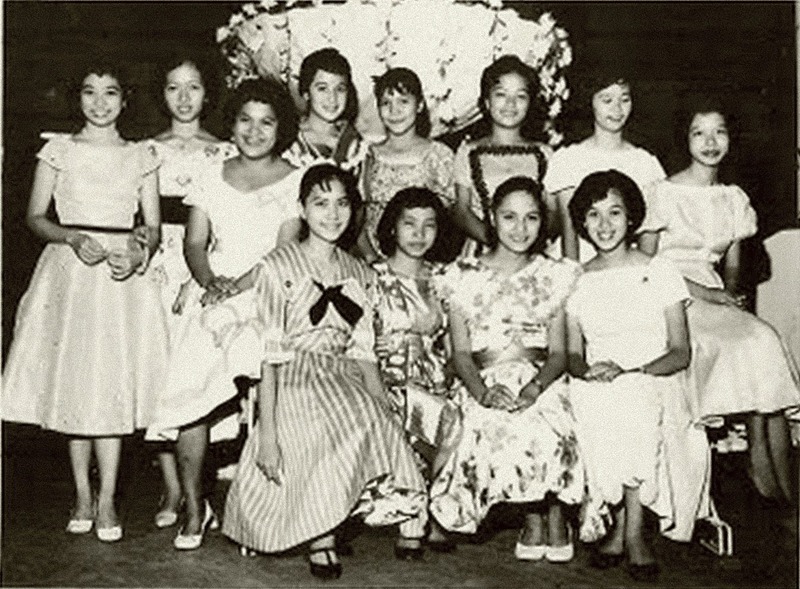 The vision of seven far-sighted Filipino women – Clara Aragon, Concepcion Aragon, Francisca Tirona Benitez, Paz Marquez Benitez, Carolina Ocampo Palma, Mercedes Rivera and Socorro Maraquez Zaballero – the nascent private, non-sectarian university had an initial enrollment of 190 students. The goal was to prepare young Filipino women for a career of service and leadership. PWU became a university in 1932 and is presently moving toward its centenary in 2020. It has coped with many hardships and tragedies, including being burned and razed to the ground during the battle for Manila in 1945. But phoenix-like, PWU rose from the ashes, grew and flourished even more vigorously determined to continue to develop the youth of the land. Currently serving both men and women from nursery to graduate school in its Manila, Quezon City, Caliraya, and Davao campuses, the Philippine Women’s University system and its Affiliate Schools for Men and Women is a corporate entrepreneurial university that uses Internet-driven, online tools for teaching and learning. 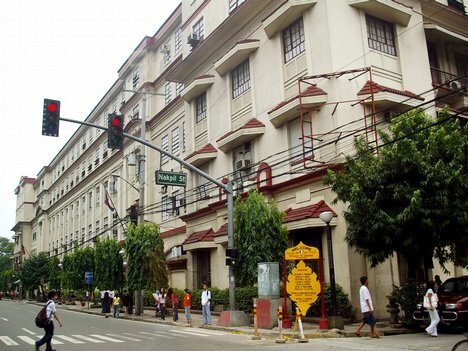 Its Malate campus at 1743 Taft Avenue occupies an entire city block bounded by Taft Avenue and the streets of Tennessee (Malvar), Remedios, and Pennsylvania (Leon Guinto). Its current president is Dr. Jose Francisco Benitez, who leads an academic staff of approximately 500 serving an undergraduate student population of 20,000. Among the outstanding achievements of PWU was the foundation of the Bayanihan Folk Dance Group in 1956 by Dr. Helena Z. Benitez, the university’s first alumna president. Acclaimed now as the Philippine National Dance Company, the Bayanihan is world-renowned and multi-awarded. It has performed, usually by invitation of the host nation, in a total of 66 countries and 700 cities worldwide. 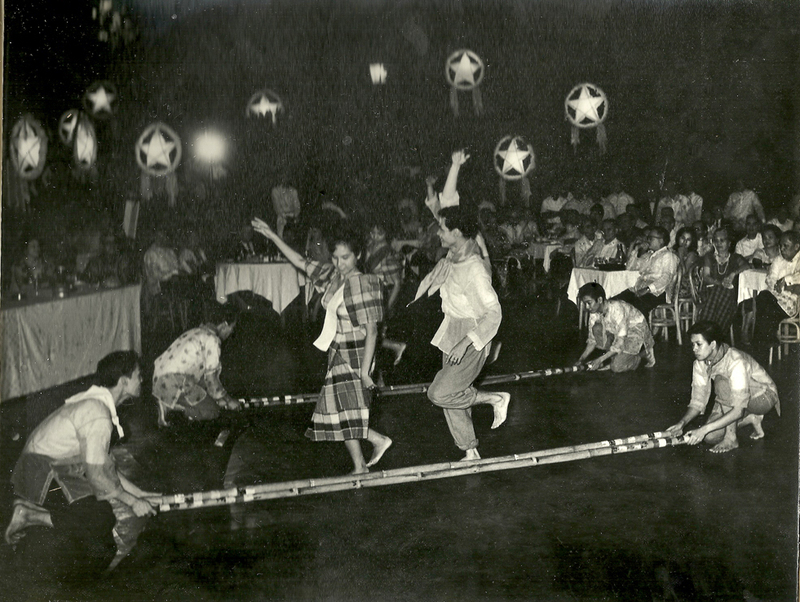 The following photos of the Bayanihan Dance Troupe were generously submitted by Manila Nostalgia reader, Herb Hendry. The troupe was performing for visiting President of Rotary International (worldwide), Carl P. Miller and his wife, hosted by the Rotary Club of Manila, at a gala fiesta at Perez Gardens, Quezon City on December 2, 1964. The folk arts center and the dance company continue to research and preserve indigenous Philippine art forms in music, dance, costumes and folklore, to restructure and enhance these research findings to evolve repertoires suited to the demands of contemporary theater, and to promote international goodwill through performances at home and abroad. Bayanihan epitomizes their combined efforts, the name means working together for the common good. My brother Bobby Ng was one of the lecturers of Philippine Women’s University. After his radio-TV work, he became a professional motivational speaker and taught a personal development course at the university. The stretch of sidewalk in front of the PWU is very familiar to me. It was here where I would walk daily with my father as he recovered from his years of brutal imprisonment, after release by the dreaded Japanese military police Kempeitai in the war. We only stopped our walks when the Japanese marines set up a large anti-aircraft gun on the rotunda of Taft and San Andres. Our walks usually turned around at Remedios Street, where across Taft I could see the Roces house. This was where Rafael “Liling” Roces Jr. lived. 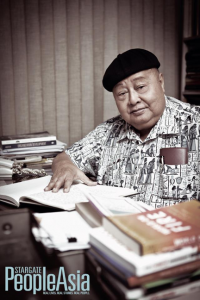 He was a Filipino journalist, writer, patriot, guerrilla leader, martyr and hero. Another historic location was the Masonic Temple (now the Scottish Rite Temple) across the street from the PWU. It was here that the Japanese massacred almost 200 people that had sought shelter in the battle for Manila in 1945. In the photo below, Philippine Women’s University is center right and Masonic Temple just above it. The road on the left is Colorado St. (Felipe Agoncillo) and the street to the right is Pennsylvania St. (Leon Guinto). This is looking south. 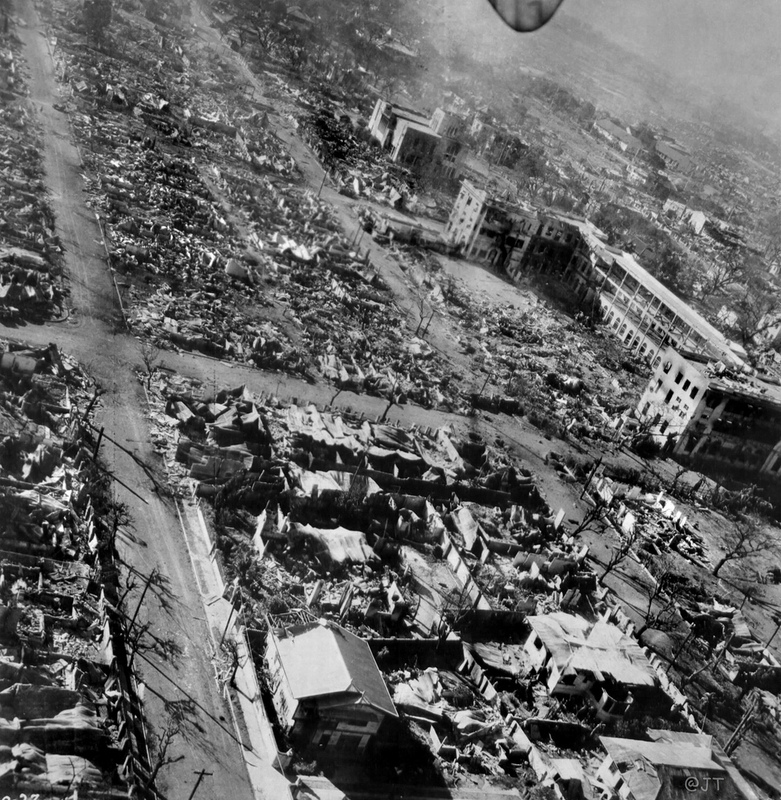 Most of the destruction shown in this photograph was caused by the burning and demolition charges set off by the retreating Japanese. No description of PWU would be complete without mentioning Jose Abad Santos Memorial School. 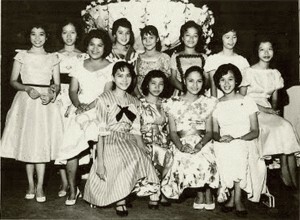 The seeds from which JASMS grew were planted in 1919 when the Philippine Women’s College was first established with its first Kindergarten class opening in A. Flores St. near Taft Avenue, Manila. The PWU Elementary Department’s use of a curriculum based on the children’s experiences began in 1933. Doreen B. Gamboa and Priscilla Abaya built an environment to meet the needs of children without having to pattern or adopt a philosophy from other schools or countries. In 1935, the Nursery school was born admitting children 18 months to 3 years of age, this was something unheard of at that time. Since the school accepted both boys and girls, it was decided to give the school a new name. Thus, the PWU Elementary Department later came to be known as Jose Abad Santos Memorial School (JASMS), after the late Chief Justice Jose Abad Santos, former Chairman of the Board of Trustees of the University. 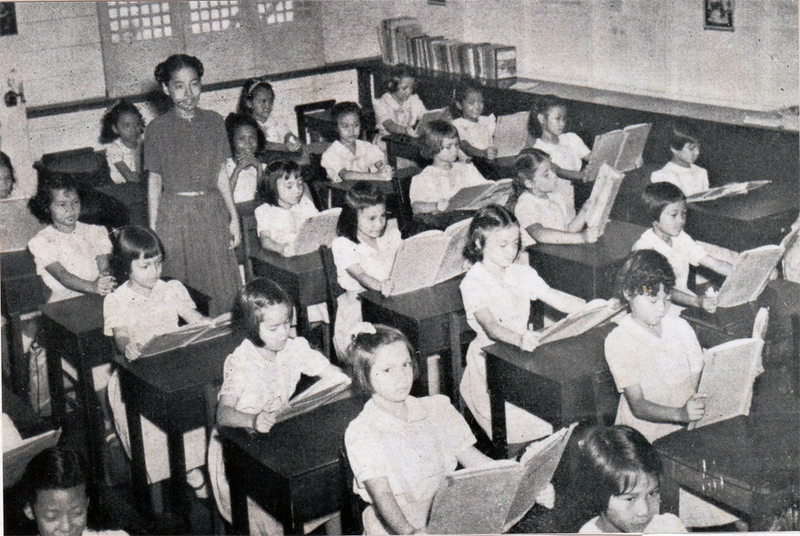 The Kindergarten School eventually expanded into a grade school and in the late 50’s the University opened JASMS along what is now known as EDSA to serve the needs of the growing community of Philamlife Homes and in 1962. The JASMS High School at Quezon City opened. JASMS Manila acquired a new site along Indiana St. (P. H. Lim) in Malate, but still maintained the (Annex) Taft Avenue facilities for the younger children. I recommend reading this article by Joy Gamboa Virata. 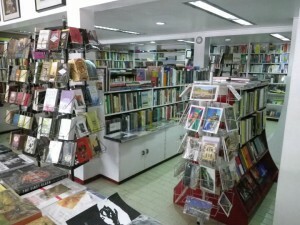 It’s a small shop, a treasure house of hard to find books, plays, political novels, monographs, Filipiñiana, and the complete works of our National Artist for Literature, F. Sionil Jose. When you walk into the store, it’s like a step into the past. It’s just like before the war, when the districts of Ermita and Malate where I lived and spent my childhood hosted numerous boutique shops, quaint bakeries, modistas, and small mom and pop shops. The mansions had Spanish names like Casa Tesoro, El Nido, and our neighbor on M. H. del Pilar, the Zobel-owned Chateau Marie. The neighborhood even developed its own Spanish patois, signs like “Cuidado con el perro” were common. This store doesn’t accept credit cards. Just like before the war, when there were no credit cards and no need for them. The store is owned by my friend Frankie Sionil Jose. I had thought he’d migrated to New York when I last checked on him, but no, he’s still here, a true survivor. To me it seems that Sionil Jose’s novel “Ermita,” the tale of a female protagonist with the same name who was born in the affluence and privilege of the Ermita before the war, is an allegorical story of Ermitans who survived the wholesale destruction of their enclave, but not the love-hate relationship of Filipinos and Americans that it engendered. Yet, like the protagonist of his novel, the story bears a hint of hope. Perhaps it’s this hope that led my old friend to set up his bookshop in Ermita, at the corner of Jorge Bocobo (formerly Nebraska) and Padre Faura. 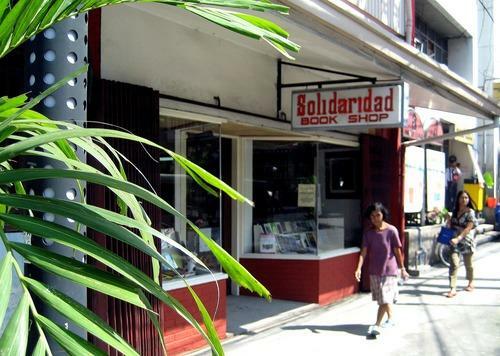 Like its namesake, La Solidaridad is not just a collection of libertarian ideas in the field of politics, science, art, literature, commerce, agriculture and industry. Established in 1965, it is more than a link to the past, a repository of Filipino aspirations. It’s a hope for the Filipino future. It’s an indictment we’re doomed to repeat if we continue to ignore our past. 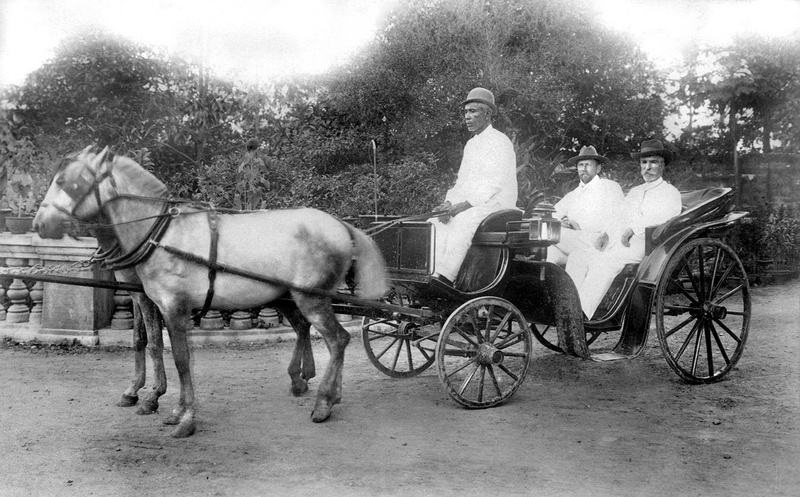 In my last post, I presented the home of Jose McMicking, at one time Manila’s Sheriff in the early 1900s. 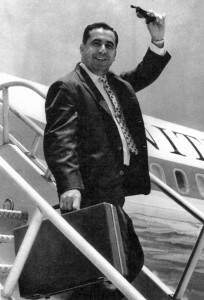 Jose married one of Rafael Ynchausti’s daughters, Angelina. The JJ Ynchausti y Compañia, a shipping and trading company dated back to 1816. The family founded Banco Español-Filipinas de Isabel II which later became the Bank of the Philippines. They were also responsible for building the Puente Colgante, owned Tanduay Distillery as well as sugar, abaca production, and paint (YCO Paints and Floor Wax) businesses. By the late 19th century, Ynchausti Shipping was the largest inter-island shipping company in the Philippines. 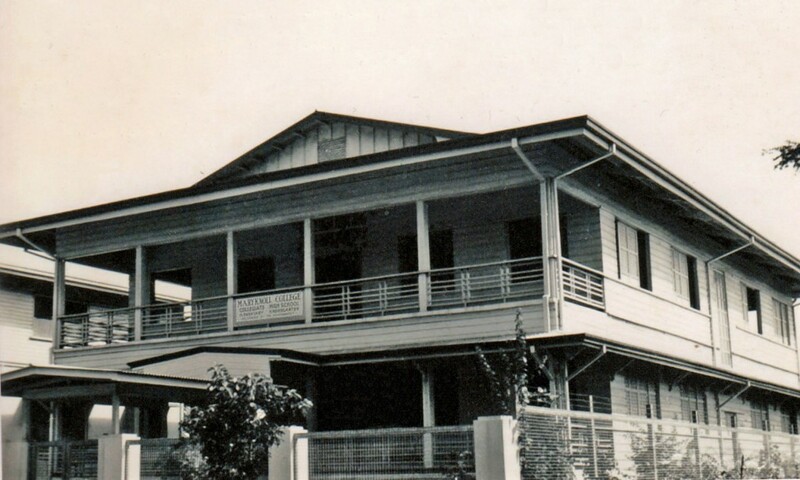 Here’s their home located on Calle Real (later M.H. 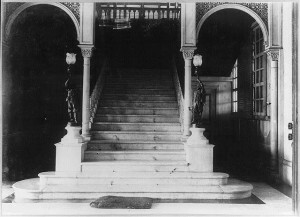 del Pilar). Their back yard faced the Manila Bay. 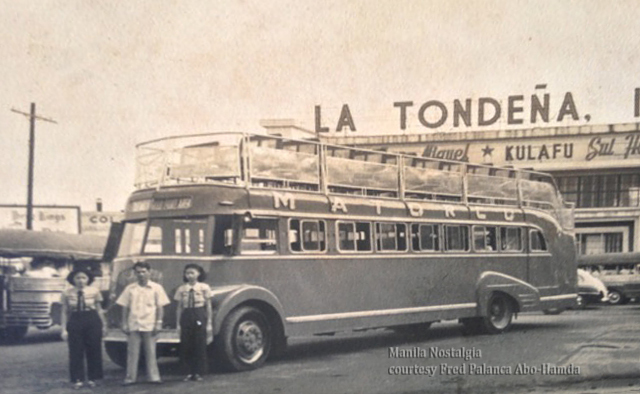 In my previous post, Malate – Ermita: Part 1, I reminisced briefly about the fun and excitement as families would take their children on an open-aired double-decker bus called the Matorco up and down the boulevard. Just recently I received an email from Fred Palanca Abo-Hamda, the grandson of Sebastian Palanca. Sebastian Palanca, was the second son of Don Carlos Palanca, founder of La Tondeña Distillery, and the brainchild of the Manila Motor Coach (Matorco). 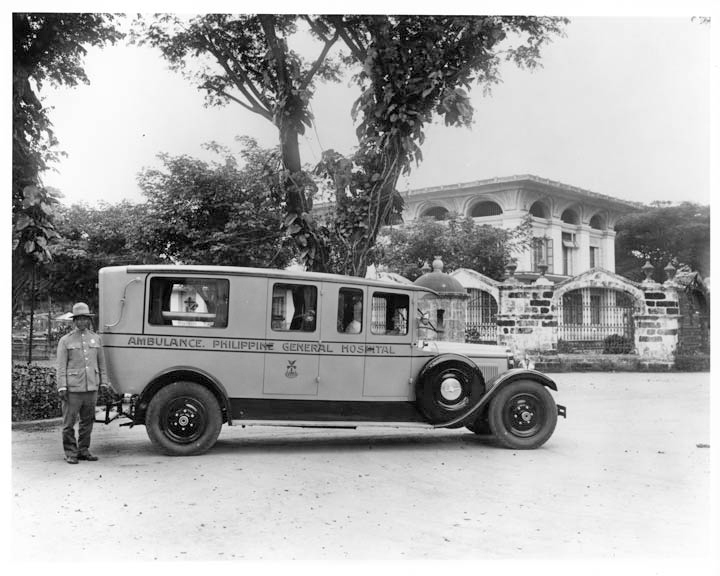 Sebastian initially invested in two buses from London back in 1948 and formed his own corporation under S.C. Palanca & Sons. 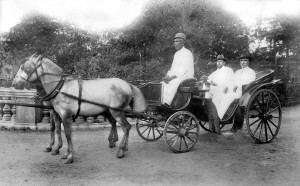 This wonderful conveyance would wind its way from 13th and Chicago Streets in the Port Area all along Dewey Boulevard up to the Redemptorist Church in Baclaran and back again. 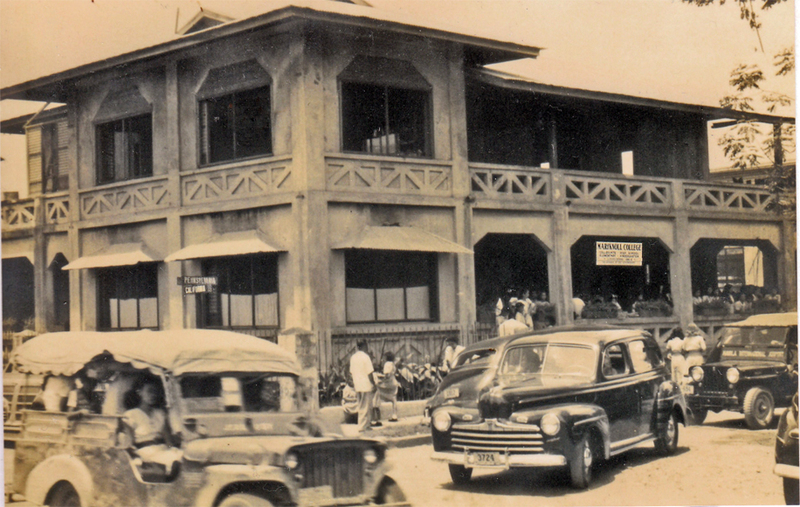 Unlike jeepneys that would stop anywhere, the buses would make around 6 stops at designated locations each way, such as in front of the Aristocrat Restaurant. Refreshments, candies, chocolates peanuts and kropek were sold onboard. 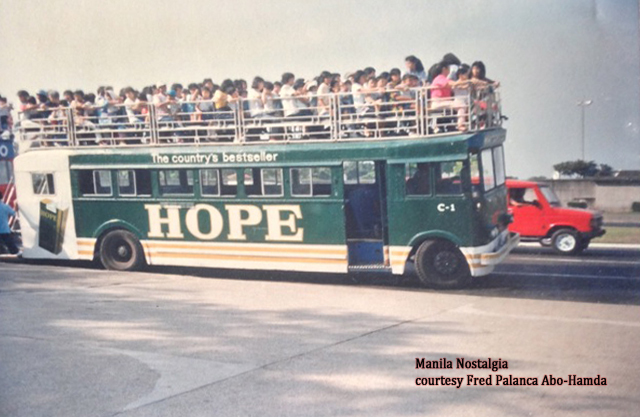 In 1975, the rates were set at 20 Centavos per passenger and children less than 1 meter height were admitted free. It stopped operation in 1994 due mainly to increased pollution, overcrowded streets and high maintenance. A big thanks to Fred for the details of our beloved Matorco. In the Fifties, the company was run by Joaquina Palanca Abou-Hamda and her siblings (see photo below). With thanks for the wonderful comments and stories from my readers and guest writers, as well as their generous submittals of photos from their personal collections, I sign off. I am heartened by the actions of many groups in Manila that are trying to save and restore our architectural landmarks. My hope is that we can once again reclaim the beauty of the old Manila we remembered and pass it on to the next generations. Thanks to Larry Ng for his continuing articles ! I’m well on my way to preparing my next post. I hope you enjoy this one and continue to write comments and emails with your memories and hopefully, more photos !! By now you are well aware of the thousands who were so enthralled by your Parts 1, 2 & 3, and clamored for more. You’re so brave to take on this challenge, not only for gathering the old photos, but taking pains to include the background history on each and every one. On behalf of my Maryknoll gradeschool and high school classmates and St. Theresa’s College schoolmates, please accept our sincere thanks for including school photos extracted from my scrapbook, bringing back memories from as far back 1949 when we were still in Grade Three. The Maryknoll nuns will be forever grateful for your detailed research on their history in the Philippines, as early as 1926. Some of those Maryknoll Sisters you featured in the photos have now gone to Heaven and probably reading Lou Gopal’s blog “from the clouds” (literally !). 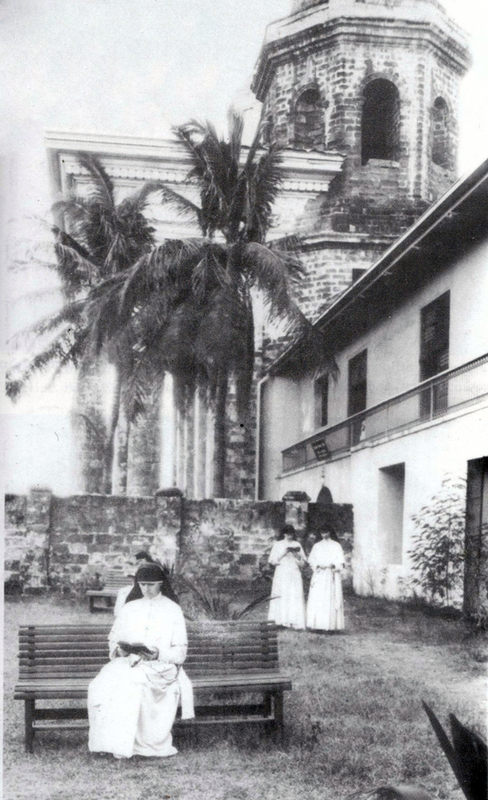 Aside from their founding one of the best private Catholic girls’ schools in Manila, the Sisters simultaneously continued their tireless and dedicated work in the missions around the Philippine provinces and destitute regions of Asia, Africa, South & Central America. They have inspired many of the students to enter the convent and work in missions in Africa. I have two High School class mates who are Maryknoll Sisters – Sister Maxima Rosanne Ong in Dar Es Salaam Maryknoll Missions and Sister Azucena (Ceny) San Pedro in Brazil. One of my employees at Alpha Tours & Travel in San Francisco – Coralis Obligacion-Salvador is a Lay Missionary in Africa working with children born with Aids. Please accept sincere gratitude from the Maryknoll Sisters around the world, who have been provided with your MANILA NOSTALGIA. Thanks for the wonderful insights about the wonderful district we both grew up in even if its of different era. I like your take on La Solidaridad. I often check out the place when Im in the area. I often find first edition books or newly published ones long before they hit the market. I found two outstanding books there regarding world war ii that usually recommend. By sword and Fire and Warsaw of Asia. Very informative books about war and liberation here in Manila based on written document. Good morning Mr. Lito Ligon, Please pardon my situation. I would like to ask if you know or have any information about locating the remains of people killed by the Japanese during World War II? The last we heard was my father being hauled out of a dungeon in Intramuros. We never recovered his body and I am the only one left from our original 5 in the family. I will surely die in peace if I can touch my father’s remain. I am 75 yrs.old now. Thank you very much for any information you may provide. By the way, I have a “gang” mate during my high school years in Laguna High School. His name is Roly Ligon. Are you related? Thanks. On this site lie the mortal remains of approximately 600 Filipinos. Their bodies were found inside a nearby dungeon where victims of the atrocities perpetrated by the Japanese imperial forces were imprisoned during the last days of February 1945. The memory of all these unknown victims of Japanese atrocities will live forever in the hearts and minds of the Filipino people. Although it says they’re unknown, I hope that somewhere, there’s a document that lists the names. Please let me know if you would like me to email you the pictures. I beg your pardon. 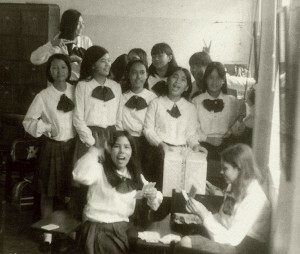 St. Theresa’s College Manila was rebuilt after the war for that’s where I graduated from high school in 1955. 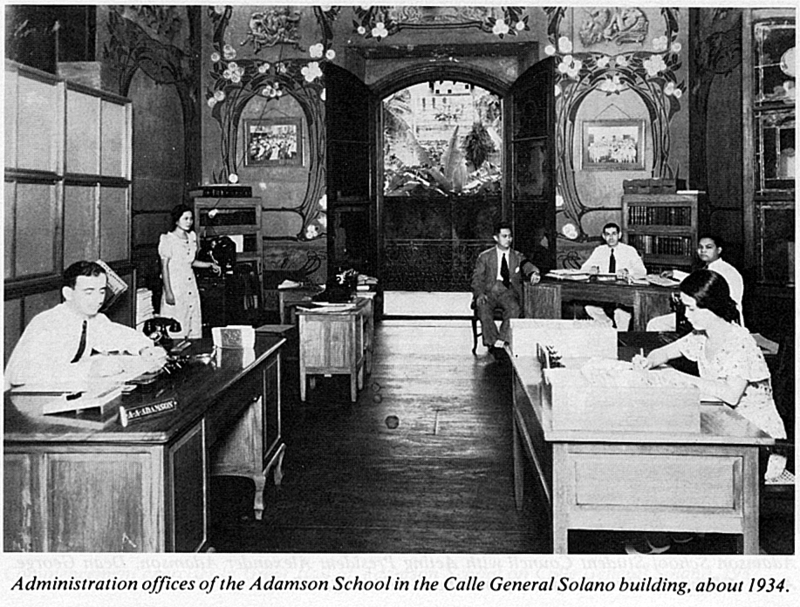 Afterwards, STCM was sold to Adamson. Thank you for spotting my error, Erlinda. I have corrected the article accordingly. Lou – As per Dada Zamora-Moreno’s observation, you are a GOOD STORY-TELLER. However, because of the info you generated from others, some could mistake you for a “historian” but we need to let them all know that you have endeavored to gather as many facts from friends residing in Manila, interviews, and internet, to “tell us a nostalgic story”. No one should be pounding on you if you make a few mis-quotes from others, re: dates/years/locations. Since you are not really a resident of the Philippines, and depended on other facts contributed by your many friends in Manila willing to assist you in these wonderful recollections of your early years in Manila. I know you have been very cautious, sending me photos to verify and other Theresian colleagues like Cielo Roque-Lutz, Susie Diez-Rueda and our STAA contact “Eslee” – who were so quick in giving you their verifications. You have earned the title of a “good story teller” and we all look forward to hearing more. Thank you Angie. I hope I can continue to earn your interest and trust with my blog. My apologies for using your site for a personal request with Mr. Lito Ligon. No problem Mr.Rayos. I hope you can find information about your father. Best of luck and good wishes ! You have consolidated stories that most could only dream of. That alone is a feat. For that I thank you. Imagine weaving together stories of districts that have disappeared altogether in time. A notable act indeed. Thanks for that and in memory of my grandmother who is loyal alumna of Philippine Women’s University, I thank you too. She has told me of many stories about life in PWU. Thanks again, Lou! Thank you Lito for your kindness and continuing help to make this series interesting ! Very happy to see the Sisters of St. Theresa included. The Sisters of St. Theresa administered Malate Catholic School when I was a student there. I remember Mother Barat, Mother Verene, and Mother Eleanora – strict disciplinarians as I recall. The school was also administered by the Irish Columbans who were the parish priests of Malate Catholic Church. Incidentally, I remember listening to Larry Ng’s radio program. If I’m not mistaken, Larry was oft known as “Larry ng buhay ko”. And of course there was Bobby Ng’s “music dedication” radio program. Dr. Luis Torres Jr, Father of Modern Urology in the Philippines graduated in 1934. He was a founder of the first medical fraternity of the country, Phi Kappa Mu and not Upsilon. He did become the Chief of Surgery and was a founder and first president of the Philippine Urological Association. Jojo, Thank you for that correction ! This is a very nice website. Manila was really fascinating back then. The names of the streets alone especially in Malate & Ermita, already contain so much history. It is sad that we now rename them after businessmen and politicians. I would also like to correct that Dr. Luis Torres founded the Second medical fraternity in the country as well as second in Asia. They were a couple of months behind Mu Sigma Phi from the same college which is recognized as the first medical fraternity in the country & in Asia. Duly noted and thank you Marcos ! Another heartwarming account! Sincerest thanks for all your painstaking efforts to make the old, genteel Manila — its buildings, its people, its ambiance — come alive for us. Would that it were possible to restore that quality to it today, or at least to some portions of it. Please know that your dedication to this project is very much deeply appreciated. More power and all the best! Thank you Jeanne, I’m glad you found the article interesting. It’s because of folks like you that keep the interest in old Manila alive. Let’s not abandon all hope of getting our heritage restored and revitalized. Thanks again, Mr. Gopal, for this wonderful series of stories featuring Malate. Though I’m not very familiar with most of the places you mentioned, as I grew up in Quezon City, I’d have to say that I still thoroughly enjoyed it. I look forward to reading more of your stories. Thanks again and all the best! Thanks Mr. Gopal for this wonderful interesting series about Ermita. I grew up in Mabini st. way back in the 50’s. My mother owned a dress shop and a gift shop. Two years ago we went home to visit but was so disappointed to see how this place looks now. I used to ride my bike on the sidewalks to the park across Ermita Church where i used to serve mass. I remember the Spanish Capuchin Priest and the “Bota Flores” celebration of the feast of Nuestra Senora De Guia in December. Anyway, my wife and i am enjoying reading your article “Manila Nostalgia”. Looking forward to see more of your articles about Manila. Thank you! I am presently in Manila. This wonderful trove of memories, i.e. 1,2,3, 4 “plus” proves and continues to be quite a source of visions of the wonderful past as it relates to the present state of things. Unfortunately some are sad ones, e.g. the Jai Alai Bldg, the decrepit state of the neighborhood of your former haunts, etc…. and, Holy Underwear. the T-R-A-F-F-I-C mess. Aristocrat and Max, among a few others keep me from sliding into the pit of depression. I have decided not to visit Escolta for obvious reasons. Anyway, I believe that the “Maryknoll College” in Malabon was named St James Academy. My wife, who graduated HS from that institution would be very interested in its history. It is also my understanding that the Maryknoll Order (Dominican- Order of Preachers) has ceased to exist- at least in the PH. I hope someone out there will provide enlightenment. I also wish that someone out there has vivid memories of significance in the “other” streets in the Binondo area. Among them would be Dasmarinas, T. Pinpin, Gandara, Florentino Torres and while we are at it a place that would relive seminal moments in our lives-The Astor Theatre. Manila Nostalgia. What an excellent reference/guide. Salamat. Since some old schools were featured here, I wonder why the OLDEST school in the Philippines, Santa Isabel College, founded in 1632 was left out? It’s rich history dating back during the Spanish colonization of the country will surely fascinate your readers. Ah, I sense an alumni of Sta. Isabela. Please be assured it has not been intentionally left out. There are others also on the list. I look forward to writing about it in an upcoming article. Thank you for your suggestion ! I can’t begin to tell you how much I’ve enjoyed your various posts. Thank you so much for the sentimental walks down memory lane. Both my parents’ families lived in the Malate area before the war and I have a high school picture of my mom at Assumption Convent. After the war, my paternal grandparents built a house on Colorado (now Felipe Agoncillo), which I fondly remember visiting often while growing up in the 50s, 60s and 70s. Again, many thanks for sharing. I look forward to more nostalgia. Please keep them coming. I really like the information and nostalgic pictures that you are sharing on your blog. Now, I just want to ask you if you are familiar with the residence of the Perez-Rubio? If you do and if you have, can you please post some pictures of their home? I know that some of their family members and a couple of house helps met their tragic death here in the hands of the Japanese. Any La Sallite from the 50’s and 60’s would know something about this narrow street. That is where we had fistfights after school because during that time, fights were also held “behind the gym” which, if you caught, resulted in suspension from school or parents of the kids involved summoned by the principal. Following day, you will know who was involved (those sporting shiners). Any La Sallite from the 50’s and 60’s would know something about this narrow street. That is where we had fistfights after school because during that time, fights were also held “behind the gym” which, if you were caught, resulted in suspension from school or parents of the kids involved summoned by the principal. Following day, you will know who was involved (those sporting shiners). Thanks Ronaldo. No, there’s no need for me to reiterate the pain and suffering we all know was there in the past. I like to remember the innocence and sweet memories of days long gone. Was it because I was a kid or was it those times ? As a little girl I remember this super gigantic coffee server on top of this building somewhere near Manila City Hall. Being small , it was awesome to look at. I cannot recall if it was a coffee or chocolate ad. Does anyone Remember? Hi Lou, your blog here is like a one stop shop. Everything about what I wanted to know and see are all here. Very informative and enlightening for me who is fond of Philippine history. I used to see the fountain known as Carriedo in Quiapo when I was a kid in the mid 50’s. We moved to LA ever since, I wonder what happened to that fountain because I didn’t see it when I visited Quiapo church lately. Soy descendiente de la familia Teus socios fundadores de la casa Inchausti junto a los Elizaldes , vivo en España y he viajado en dos ocasiones a Filipinas y tengo fotos y relatos de la epoca , por si alguien esta interesado . We lived right behind PWU and the street beside it is not Remedios but Vermont St. (Now Julio Nakpil). The houses around there that were demolished were as a result of American carpet bombing of Manila during WWII. My Dad use to tell me stories of how they hid in a trench beside our house under galvanized iron sheets while American soldiers were being shot at by Japanese snipers in PWU. There was also a tunnel from PWU to the Masonic temple used by the Japanese to escape. 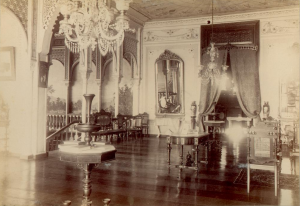 According to the Digital Collections of the University of Wisconsin (as well as sites discussing the Philippine-American War), there are pictures (dated c.1901-1902) of a house and its sala depicting it as used by the United States First Philippine (Schurman) Commission. Having a feeling the house certainly to be located in Malate, I checked search sites, ending up here (rifling thru your Malate-Ermita posts), and yes, finally identified the same pictured house. Can you confirm that the Ynchausti Mansion is the same house used in the negotiations with Schurman & Aguinaldo’s representatives (incl. Gregorio del Pilar)??? I found a site dedicated to the Ynchausti family. One section was dedicated to its famous mansion (though the areas covered were limited).